Top frames are made from 1 1/4" satin finish anodized, heavy wall square tubing, patterned from OEM suppliers. All tops are 56: maximum height, eight feet long and are available in 96" or 102" widths. Available in the same white marine vinyl and seven (7) great colors of Ultima solution dyed polyester as Taylor Made's 1" Square Bimini. Tops zip onto frame for easy installation. 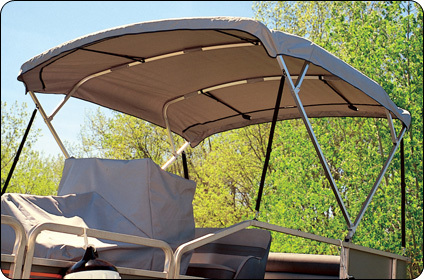 Come complete with stainless steel fasteners, nylon fittings and aluminum deck mounts.